It all started when I looked at our main flower border. The daylilies had got out of control. They were literally everywhere, smothering irises, roses and newly planted birch trees. But I don’t like throwing plants away, and was wondering who I could give them to. Incredible Edibles by Matthew Biggs and the RHS – grow something different in your fruit and veg plot. The dish holds roasted daylily roots and the greens are daylily shoots. And not it’s not only daylilies that are edible – according to Incredible Edibles, you can also eat dahlias, red orach, hostas, amaranth and fuschia berries, all of which I grow in my borders. I then checked with James Wong’s Homegrown Revolution. This was the first book to introduce me to the idea of eating the roots of canna lilies, dahlias and other flower border plants. He confirmed that ‘all parts of daylilies are edible’ and that daylily flowers are sold for eating throughout east Asia. So yes – you can eat the flowers, spent flowers, buds, shoots and roots of daylilies. I may never have to go to the supermarket again. Just a small section of the main border – daylilies are crowding out everything else. We set out to dig up the daylilies on Saturday afternoon, armed with a copy of Incredible Edibles, plus several mobile phones and tablets. Firstly, daylilies are not lilies. 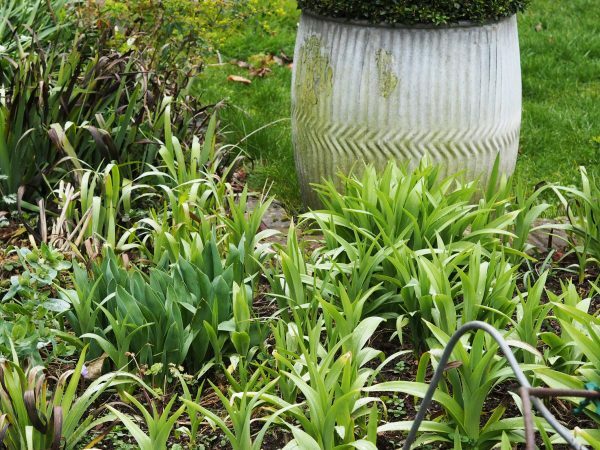 They are ‘hemerocallis’ and grow from rhizomes, while lilies grow from bulbs. Lilies can’t be eaten, while daylilies are edible. It’s an important distinction. Secondly, the emerging shoots of iris look quite like the emerging shoots of daylily. But iris is also toxic. 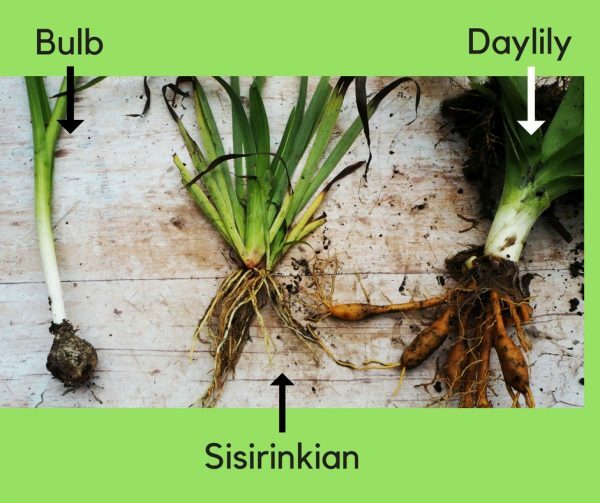 Other confusing shoots in the main border include sisirinkian and other bulbs, such as alliums and tulips. Although once the plants are in flower, it’s much easier to identify them all. Many flowers in our flower beds look like daylilies, but only daylilies are edible. Check carefully! There’s good growing and cooking advice for daylilies in Incredible Edibles. But it doesn’t have a good botanically accurate close-up of daylily roots and shoots. Neither does Homegrown Revolution. However, there are good photos of day lily flowers in Incredible Edibles. You can add the flower petals to salads, saute the buds or deep-fry partly-opened flowers as tapas. It’s important to check because other flowers can be toxic. James Wong’s Twitter feed often fumes about fashionable bloggers who Instagram poisonous flower decorations on their food. And, as we were eating the roots and shoots, we needed to know exactly what we were digging up. It’s especially important not to confuse daylily roots with iris rhizomes or bulbs. Check several sources, unless you are a botanist yourself. These photos will help, but getting muddled could poison you. We checked several internet sites, and recommend you do too! 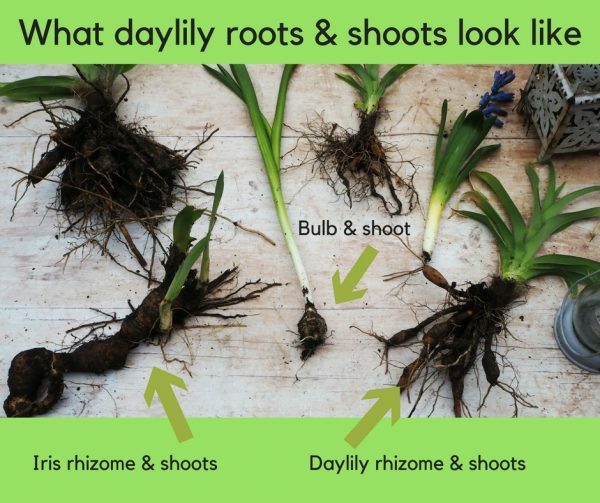 Daylily roots and shoots in comparison with iris rhizomes and what a bulb looks like. If you can supply an answer to any of these conundrums, please do! Although not too much detail on the edible undies, please. Sorry, back to gardening again. So that’s what we did. 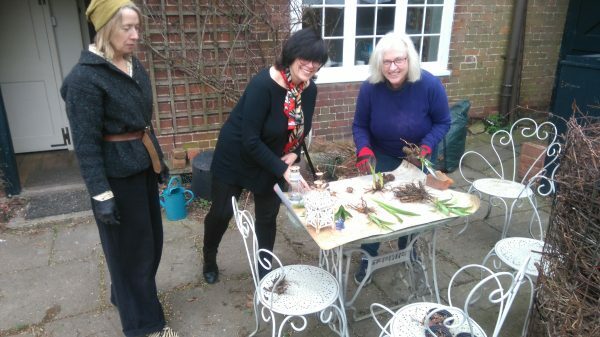 Sally and I dug the daylilies up, while Jacqui then washed the soil off the clumps of roots. She definitely had the bad end of the deal. It took about half an hour to clean off the soil, then take the tiny hairy roots off the daylily rhizomes to make them look like the photo below. 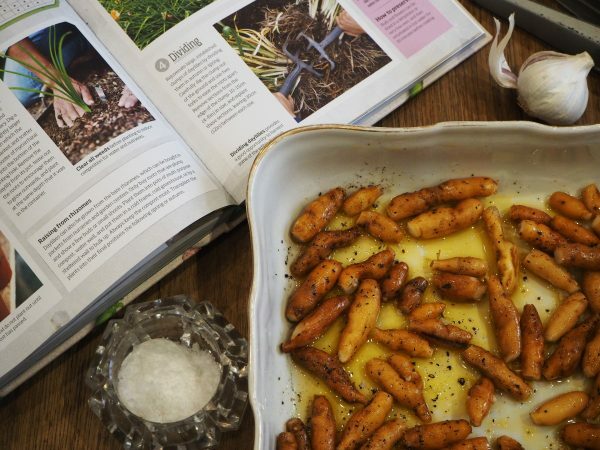 We nibbled the roots raw and thought they were a bit like radish. Quite nice. Incredible Edibles and daylily roots ready for roasting in oil and garlic. Meanwhile the green shoots of the daylilies were easy to cut and clean. We stir-fried these with garlic. They were delicious, and tasted like something you might get in a Chinese restaurant, with a leek-onion flavour. So it’s likely that I’ve probably eaten stir-fried daylily leaves before without knowing it. Although stir-fried daylily greens will probably feature more often. I cut some of the shoots off still-planted plants to see how cut-and-come-again they are. They’ve grown about 6″ in only 10 days. And what about Incredible Edibles? Although edible flowers are very fashionable at the moment, I find it hard to get my head around eating plants that I normally grow for flowers. But I thought Incredible Edibles was really worth buying, because there’s no logical reason for our current division between plants you eat and ones you grow for decoration. I’m also growing salsola for the first time this year, and Matthew Biggs’ planting advice was very helpful (better than the seed packet!). We switched back and forth from Incredible Edibles and Homegrown Revolution, as each had elements that the other didn’t. Matthew Biggs trained at the Royal Botanic Gardens, Kew and is very much a horticulturalist, so the growing advice was excellent. There are also useful sections on growing incredible edibles in pots, and in small gardens. 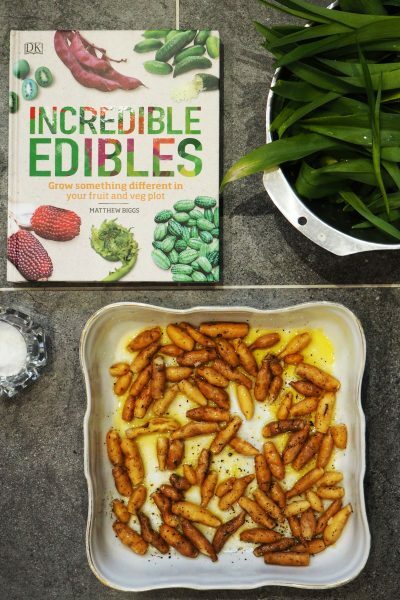 Incredible Edibles isn’t just about flowers you can eat – it covers a wide range of unusual edible plants – it would make a good present for someone who is interested both in grow-your-own and is adventurous about food. I’m really excited about that, as it should keep me dead-heading my daylilies. So future guests will be nervously looking up ‘daylilies are edible’ on their tablets and mobile phones! And if you’re also interested in using plants as medicine, read this post on medicinal plants to grow in your garden. Incredible Edibles by Matthew Biggs and the RHS – how to grow and eat surprising plants! 10 comments on "Daylilies are edible – how to eat from your flowerbed"
Ummm, very interesting read, but I think I’ll pass on eating my daylilies. I think I like them in the garden or in a vase better than on my plate. Happy gardening! I know what you mean! I’m going to try the spent flowers though, when we get to that stage. The possums like my daylillies too! I keep meaning to try my day lilies, although I always thought it was mostly the unopened flowers that were eaten. Your post has inspired me to give it a go. One thing I can recommend eating are mallows (malva spp.). Malva moschata happily self seeds in our garden and the leaves make a pretty acceptable lettuce substitute. Leaves and flowers are both edible, and other members of the family are widely cultivated as salad greens in other parts of the world. Many campanulas, violas etc also have edible leaves but are tougher so less nice on their own. If you’re interested in unusual edible tree parts as well, the new leaves of both lime (tilia) and beech are edible. Old leaves get tough though. I’ve recently discovered you and your wonderful blog/videos. Having just moved to a bonkers garden in beautiful East Devon, bigger than a courtyard, less than an acre, I’m desperately seeking inspiration and know how to soften the hard edges and enhance the fabulous views. You’re a great help!